Current hormonal therapies have benefited millions of patients with breast cancer. Their success, however, is often temporary and limited to a subset of patients whose tumors express estrogen receptor alpha (ER). The therapies are entirely ineffective in ER-negative disease. Recent studies suggest that there are many biological pathways and alterations involved in determining whether ER is expressed and how it is regulated during breast cancer evolution. Improving hormonal therapies, in addition to perfecting current strategies, will also target these newly discovered pathways and alterations, and others yet to be found. The present commentary will briefly highlight a few important observations and unanswered questions regarding ER status and growth regulation during breast cancer evolution, which hopefully will help to stimulate new thinking and progress in this important area of medial research. Invasive breast cancers (IBCs) can be divided into two subtypes based on whether or not the tumor cells express estrogen receptor alpha (ER) in their nuclei. The ER status is important because, when circulating estrogen binds ER, it stimulates cell division and tumor growth . Many strategies have been developed over the years to inhibit this estrogen-induced mitogenic pathway. Numerous previous studies have shown that these so-called hormonal therapies significantly prolong life, although they rarely cure patients with ER-positive IBCs, where the mitogenic pathway is intact, but that they are ineffective in ER-negative disease, where the pathway is inactive . More recent studies suggest that hormonal therapies can also delay or prevent the development of IBC in high-risk women, primarily by reducing ER-positive disease, although longer follow-up may show a benefit in ER-negative disease as well . Despite their usefulness, current hormonal therapies are still imperfect and improving them will depend on gaining a better understanding of the cellular and molecular mechanisms responsible for determining whether ER is expressed and how it is regulated during the evolution of IBCs. There are probably several mechanisms and, although none are understood at a fundamental level, several clinical, pathological, and experimental observations provide food for thought for future research in this area . All IBCs appear to evolve over long periods of time from premalignant breast lesions, which in turn appear to evolve from normal epithelial cells lining terminal duct lobular units (TDLUs) . Understanding ER and growth in IBCs may benefit from, or even depend on, a similar understanding of their precursors, especially normal cells. Since estrogen, presumably mediated through ER, appears necessary to stimulate mitosis and populate the TDLU with normal epithelial cells, one might postulate that all epithelial cells or their ancestors must express ER at some time during their lifecycle. Immunohistochemical studies of normal breast tissue from adult women, however, show that while nearly all TDLUs contain ER-positive cells, on average only about 30% of the cells are positive at one point in time (Fig. 1a), and they are almost never dividing . In fact, dividing cells account for less than 5% of the population overall, and they are almost always ER-negative . The largest population in normal breast consists of ER-negative nondividing cells. This mix is hard to explain if they are stable populations unless, for example, they came from an ER-positive or otherwise estrogen-responsive stem cell and are differentiated in diverse directions afterwards. Alternatively, perhaps ER expression and cell division occur sequentially in the same cells, with intervening periods of receptor negativity and quiescent cell cycling, which would be difficult to detect with static assays such as immunohistochemistry. The answer is unknown but important because estrogen, mediated through ER, directly or indirectly stimulates cell division, and only dividing cells are able to propagate the genetic alterations responsible for the evolution of premalignant lesions to breast cancer. Examples illustrating typical levels of estrogen receptor alpha (ER) expression in normal and premalignant breast epithelial cells (dark nuclei, ER-positive as assessed by immunohistochemistry). On average, (a) normal premenopausal terminal duct lobular units contain about 30% ER-positive cells. In contrast, nearly all cells express very high levels of ER in the majority of premalignant breast lesions, including (b) atypical ductal hyperplasia, (e) atypical lobular hyperplasia, (f) and lobular carcinoma in situ. Ductal carcinoma in situ is an exception, showing a continuum of ER expression ranging from (c) very high levels characteristic of histologically lower-grade lesions to very low levels characteristic of higher-grade lesions, including a substantial subset (~25%) that is entirely ER-negative (d). Although the precise nature of premalignant evolution is controversial, especially the earliest stages, most models agree that IBCs evolve in a nonobligatory fashion through an increasingly abnormal series of hyperplasias, atypical hyperplasias, and noninvasive or in situ carcinomas . Certain lesions are widely acknowledged to have significant premalignant potential, including atypical ductal hyperplasia (ADH) and atypical lobular hyperplasia, and their more advanced counterparts ductal carcinoma in situ (DCIS) and lobular carcinoma in situ, respectively . Unlike normal TDLUs in which ER is expressed in a minority of cells, most of these precursors express high levels of ER in nearly all cells (Fig. 1b,1c,1e,1f) . The major exception is DCIS, which show an evenly distributed continuum of ER expression from very high to very low levels, including a subset (~25%) that is entirely ER-negative (Fig. 1d) . Also unlike normal TDLUs, in which dividing cells are nearly always ER-negative, the majority of dividing cells in most precursors are ER-positive . Thus, two abnormalities highly characteristic of the majority of premalignant lesions, especially early lesions, are a large increase in ER-positive cells overall, and in ER-positive dividing cells, with perhaps the latter representing an expanded stem cell or progenitor cell population. All premalignant lesions contain at least a few ER-negative epithelial cells, however, which could also play a progenitor cell role in the evolution of some IBCs. Compared with the majority of premalignant lesions except DCIS, IBCs show much more diversity regarding the proportion of lesions containing ER-positive cells, the proportion of ER-positive cells in each lesion, and the proportion of dividing cells that are ER-positive . About 75% of IBCs contain ER-positive cells, but the proportion varies on a continuum ranging from less than 1% to nearly 100% (Fig. 2) . In ER-positive IBCs, the proportion of dividing cells that are ER positive also varies from less than 1% to nearly 100%, but the average is more than 100-fold above that of normal cells . The remaining 25% of IBCs contain no ER-expressing cells, so all the dividing cells in this group are ER-negative. 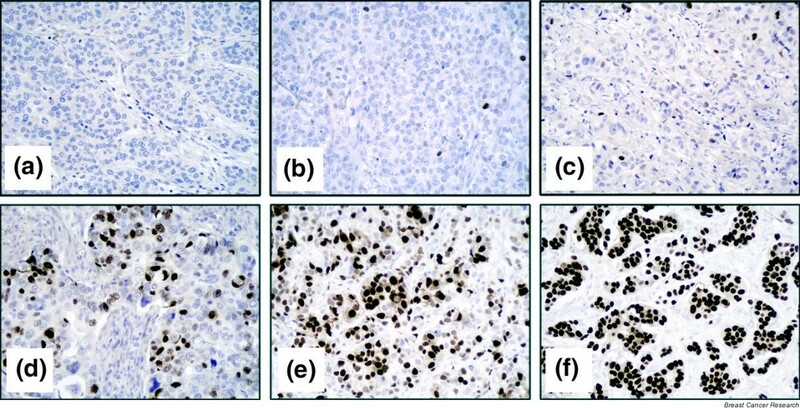 Examples illustrating the wide range of estrogen receptor alpha (ER) expression characteristic of invasive breast cancers (IBCs) (dark nuclei, ER-positive as assessed by immunohistochemistry). 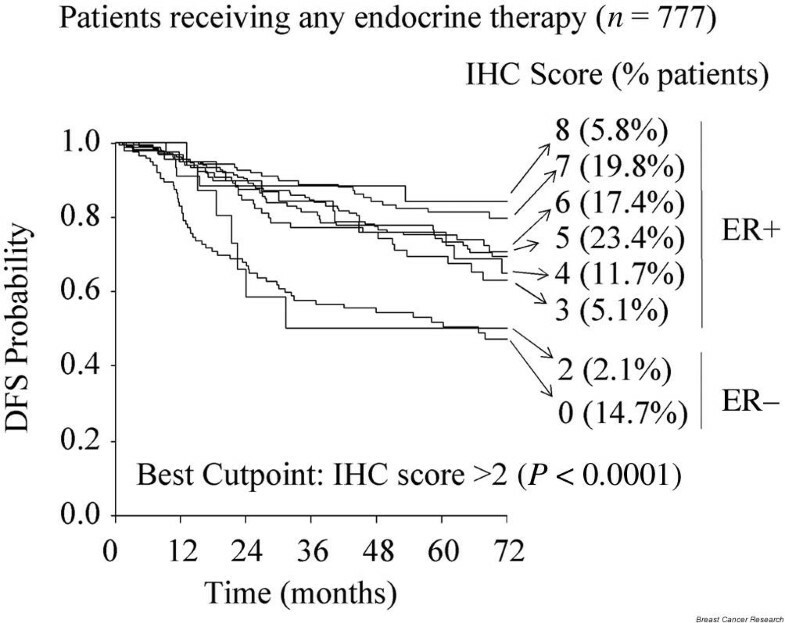 (a) A substantial (~25%) subset of IBCs does not contain any ER-expressing cells. The majority (~75%), however, do contain ER-expressing cells, but the proportion varies on an evenly distributed continuum ranging from (b, c) very low, to (d, e) intermediate, to (f) very high. The clinical definition of an ER-positive IBC is one with a statistically significant chance of responding favorably and safely to hormonal therapy. This simple definition is satisfied by a biologically diverse group of tumors showing a wide range of ER expression from very low to very high. Although there is a gradient of clinical response directly correlated with ER content, the gradient is skewed such that tumors containing even a very small proportion of ER-positive cells (e.g. between 1% and 10%) respond far better than ER-negative tumors, and nearly as well as tumors with high levels of ER (Fig. 3) . Assuming that this surprising clinical response is based on inhibiting estrogen-stimulated growth mediated through functional ER, it raises several questions regarding the nature of stem or progenitor cells that could produce and sustain such heterogeneous populations in the first place, yet still respond in a similar manner to hormonal therapy. Whether it is just the ER-positive cells that are capable of dividing, or whether ER expression and growth are cyclical phenomena in the same cells, or both, or whether entirely different mechanisms are operating are all unknown at this time. Kaplan-Meyer curves illustrating the surprising skewed relationship between estrogen receptor alpha (ER) status (immunohistochemistry [IHC] scores) and clinical outcome (disease-free survival [DFS]) in patients (n = 777) with invasive breast cancer treated with adjuvant tamoxifen therapy (reproduced with permission) . Tumors with as few as 1–10% ER-positive cells (IHC score = 3) respond far better than ER-negative tumors (IHC score = 0 and 2 corresponding to none and < 1% ER-positive cells, respectively), and nearly as well as tumors with much higher ER content (IHC score = 4–8 corresponding to > 10% to 100% ER-positive cells). The observation that tumors with a low proportion of ER-positive cells respond almost as well as those with a very high proportion raises important questions about the nature of stem cells that could produce and sustain such biologically diverse but clinically similar populations. A significant (~30%) proportion of ER-positive IBCs do not benefit from current hormonal therapy at all, which is hard to explain without invoking other mechanisms that augment or entirely bypass the classical estrogen-stimulated mitogenic pathway. Recent laboratory studies are confirming and shedding light on such alternate pathways. For example, contrary to the prevailing notion that ER is entirely in the nucleus, it was recently learned that a small amount of functional ER may also reside in the outer cell membrane, especially in tumor cells overexpressing certain growth factor receptors, such as epidermal growth factor receptor (EGFR) and HER2, which are also in the outer membrane. Tamoxifen, one of the most commonly used types of hormonal therapy, appears to function as a beneficial antagonist on nuclear ER, but as a harmful agonist on membrane ER . Activated membrane ER can then activate adjacent EGFR and/or HER2, which may then stimulate tumor growth. Theoretically, other types of hormonal therapies such as the aromatase inhibitors, which greatly reduce endogenous estrogen, might remain beneficial in this setting. There are almost certainly additional undiscovered mechanisms explaining why some ER-positive IBCs fail to benefit from hormonal therapy at all, or respond initially only to become resistant later, which is unfortunately very common. ER-negative IBCs are a more obvious departure from normal breast epithelial cells than ER-positive IBCs in the sense that they contain no ER expressing cells yet still manage to survive and grow. In fact, ER-negative IBCs are often histologically high-grade, rapidly proliferating tumors. Most ER-negative IBCs probably evolved from ER-negative DCIS, which both represent about 25% of their respective categories and resemble each other in many other ways. However, this just refocuses the question on the origin of ER-negative DCIS. In this regard, most DCIS probably evolved from ADH, in which nearly all cells are highly ER-positive. The DCIS that develop directly from ADH are thought to be predominately histologically low-grade/ER-positive lesions. While often overlooked, there is considerable evidence suggesting that higher-grade/ER-negative DCIS may evolve from lower-grade DCIS as they accumulate additional genetic/epigenetic alterations that influence cell morphology, arguing that even high-grade/ER-negative DCIS evolve from ADH, although indirectly. However, at least a few ER-negative cells are present in all types of premalignant lesions, including ADH, and they could be involved as progenitor cells in the development of ER-negative DCIS. For example, perhaps these rare cells represent a stable ER-negative population normally supported by estrogen-induced paracrine factors from adjacent ER-positive cells, which can become independent of this support, achieve a growth advantage, and progress to ER-negative breast cancer. Consistent with this, investigators commonly derive 'normal' cell lines from primary human mammary epithelial cells that, surprisingly, are nearly always ER-negative. Human mammary epithelial cells show gene expression patterns similar to so-called basal IBCs, which are also ER-negative , leading to the speculation that they may represent a stem cell population for receptor-negative breast cancer . On the whole, however, the majority of available evidence suggests that most ER-negative DCIS or IBCs arise from ER-positive precursors or cells that stop expressing the receptor. For example, prolonged exposure to estrogen, especially during adolescence, is among the strongest risk factors for eventually developing IBC, presumably by allowing genetic alterations to accumulate in ER-positive cells continually stimulated to proliferate . Of the IBCs that eventually develop, about 25% are ER-negative, consistent with the idea that some ER-positive precursors stopped expressing the receptor after being initiated. The incidence of ER-positive tumors is significantly higher in small than large IBCs, also supporting the notion that ER expression is turned off in some tumors as they progress and enlarge [7, 12]. Reducing estrogen by oophorectomy in high-risk carriers of BRCA1 mutations greatly reduces the overall incidence of IBC, including ER-negative tumors, which indirectly argues that ER-dependent or otherwise estrogen-dependent pathways give rise to ER-negative disease . Similarly, although tamoxifen in the NSABP-P1 Breast Cancer Prevention Trial primarily reduced the incidence of ER-positive IBCs in the short term , longer follow-up has more recently shown a reduction in the incidence of premalignant disease , which could eventually translate to a reduction in ER-negative IBCs that might evolve from them. There are other more concrete examples providing further evidence that ER-negative breast cancers might evolve from ER-positive precursors or cells. For instance, nearly all IBCs are associated with a noninvasive component (DCIS and/or lobular carcinoma in situ), probably representing residual precursors. In a small (~5%) proportion of ER-negative IBCs, the in situ component is ER-positive, often strongly so (Fig. 4). Another case in point is that 10–20% of metastases associated with ER-positive primary IBCs are entirely ER-negative [3, 15]. Examples supporting the opposite (the evolution of ER-positive DCIS or IBCs from ER-negative precursors or cells) are almost unheard of, further implying that ER-positive is the predominant precursor phenotype. These examples are associated with relatively advanced stages of breast cancer evolution (DCIS or beyond) with prominent genetic instability and diversity, which could result in the loss of ER expression. Surprisingly, however, there is very little evidence that mutations or chromosomal imbalances play a significant role in the loss of ER, suggesting that other regulatory or epigenetic mechanisms secondarily downregulate gene and/or protein expression. Discordant estrogen receptor alpha (ER) expression in occasional breast cancers strongly suggests that mechanisms exist that are responsible for the evolution of ER-negative from ER-positive tumor cells. For example, nearly all invasive breast cancers (IBCs) contain varying proportions of ductal carcinoma in situ (DCIS), probably representing residual precursors. 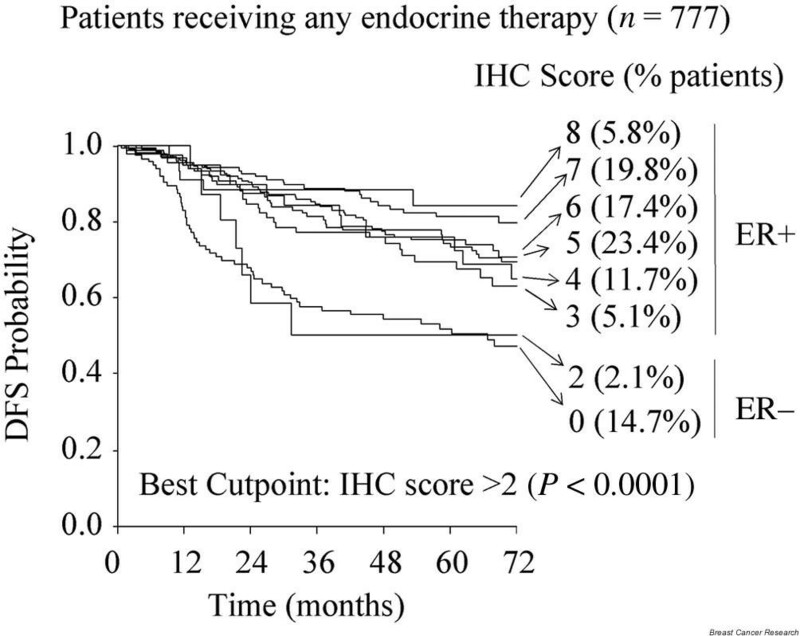 (a) In ~5% of ER-negative IBCs, the DCIS component is strongly ER-positive. As another example, histologically high-grade DCIS are often (~70%) ER-negative. (b) A diligent search can reveal foci of lower-grade/ER-positive DCIS in the same breast, which may be a precursor to the higher-grade/ER-negative component. It was noted many years ago that IBCs overexpressing certain membrane growth factor receptors (EGFR, HER2, and fibroblast growth factor receptor) were often ER-negative [16–18], suggesting that this subset of tumors selected alternate mechanisms of growth bypassing the classical estrogen-induced mitogenic pathway. However, although laboratory studies transfecting and overexpressing these receptors in ER-positive breast cancer cell lines inhibited their responsiveness to estrogen [19–21], including estrogen-induced growth, they continued to express ER, suggesting that these pathways may only be partially involved in the evolution of ER-negative breast cancer. Experiments overexpressing the raf proto-oncogene, which transduces peptide-induced mitogenic signaling through the mitogen-activated protein kinase pathway, causes ER-positive breast cancer cell lines to become ER-negative and insensitive to estrogen . Similar studies upregulating c-Jun expression, a component of the AP-1 transcription factor pathway, results in loss of ER and responsiveness to estrogen in ER-positive cells . 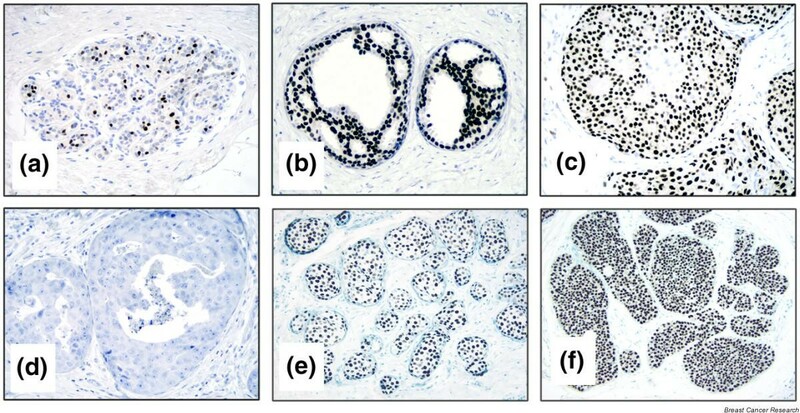 More recent studies have also shown that exposing ER-positive breast cancer cell lines to low oxygen levels, a common condition in vivo during breast cancer evolution, especially in certain lesions such as high-grade DCIS, can result in loss of ER through protein degradation, possibly mediated by upregulation of the transcription factor hypoxia-induced factor 1 alpha . Among the most interesting mechanisms that may be playing a role in the evolution of ER-negative breast cancers are those normally involved in reversibly downregulating gene transcription by altering chromosomal structure, such as DNA methylation and histone acetylation . Clinical studies have shown that methylation of the ER gene is much more prominent in ER-negative than ER-positive IBCs, and possibly responsible for turning off ER expression. Related laboratory studies have shown that inhibitors of methylation and histone deacetylation in ER-negative breast cancer cell lines can reactivate the expression of functional ER, generating hope that similar strategies can be used in patients with ER-negative IBC, converting their tumors to ER-positive, which may then be responsive to conventional hormonal therapies. There are three general goals for better hormonal therapies in breast cancer, including improving therapies for ER-positive disease, finding therapies for ER-negative disease and, especially, broadening therapies for prevention to include ER-negative disease. Achieving these goals will depend on gaining a better understanding of the mechanisms determining whether ER is expressed and how it is regulated during the evolution of normal cells to premalignant lesions to breast cancers. Many critical questions remain unanswered regarding the existence, identity, and ER status of stem cells that may be central to this evolution. The majority of available evidence suggests that most breast cancers, including ER-negative breast cancers, arise from ER-positive or otherwise estrogen-responsive progenitor cells through potentially reversible epigenetic mechanisms. Other possibilities remain, however, such as the existence of a small, stable ER-negative population with stem cell properties for a subset of ER-negative disease. On the bright side, each newly revealed mechanism represents a potential target for more effective therapies. This work was supported in part by National Institute of Health/National Cancer Institute funding for the Specialized Program of Research Excellence in Breast Cancer Grant P50-CA58183.